Linda Burton posting from Juneau, Alaska – Heading for Alaska? 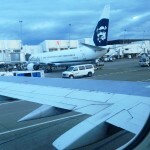 Your first thought is likely Alaska Airlines, you know, the one with the Native Alaskan painted on the tail. Distinctive. Grandson Sam and I are headed for Alaska, specifically the capital city of Juneau, where there are no roads in and no roads out. 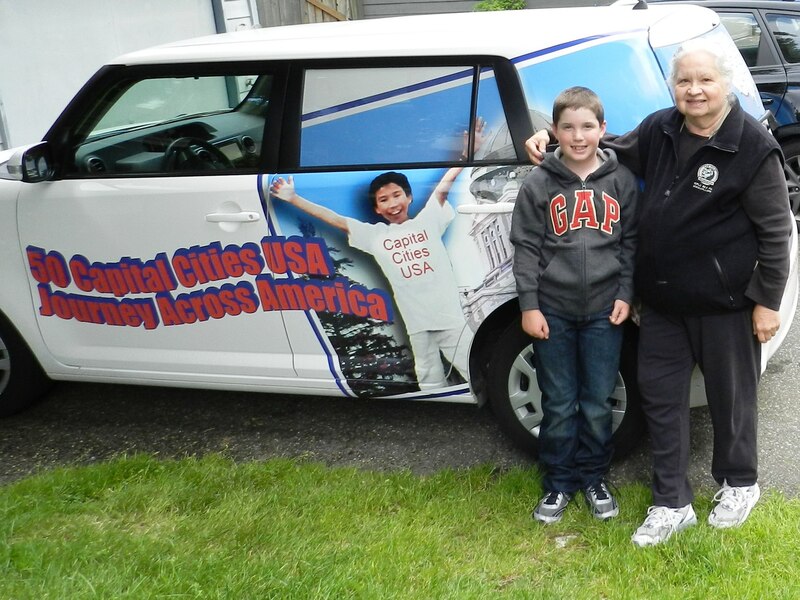 Get there by cruise ship, get there by ferry, or get there by plane. Since we are “on a mission” we chose the fastest method. Seattle was a mass of road closures today; bridges blocked for repair; ramps getting reramped; and a Mariner’s baseball game at Safeco Field to boot. Being a woman of caution, I suggested a four-hour window of safety since we had to pass through the entire north-to-south mess. Turns out of course, it didn’t take long to get there and check in; we made our gate with two hours to spare; time for dinner, time to buy books and snacks, time to relax and read and chill. 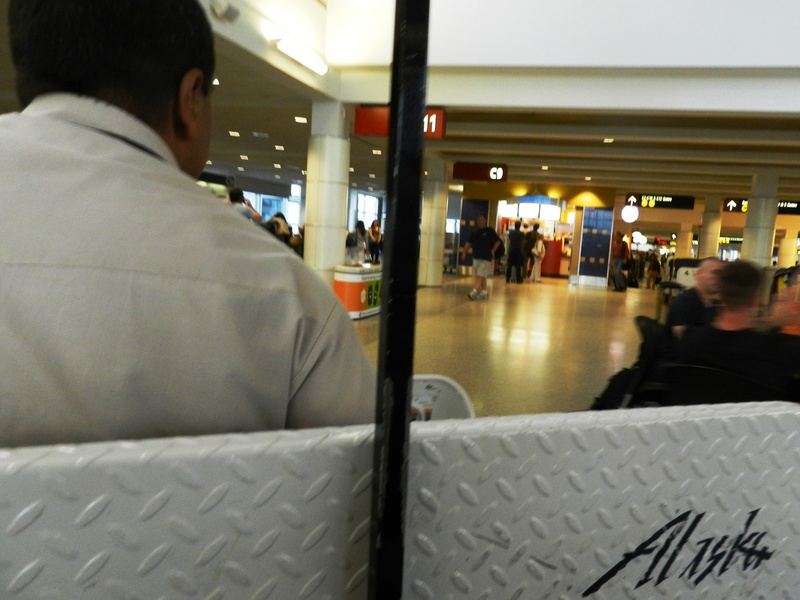 At 15 minutes to boarding, a wisp of a memory surfaced; the admonition given when I checked my bag –“Pay attention to your gate, it may change.” There were no people crowding around, I realized with a somewhat sinking feeling. At the counter, I got the news, “Juneau departs from D3.” We were at C16, as specified on our ticket. Panic! They called for a cart. 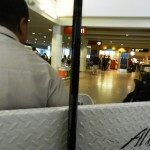 The highlight of the day, a beeping noisy ride; (it’s the ambulance of the airport), get out of the way! Careening down the walkway, commanding everyone aside, we got there just as boarding began. A window seat for me, Sam wanted the middle; off the ground and in the air. Flying high over the snow-tipped Canadian Rockies, a little bit of shoreline always there in view, it’s two hours nonstop to Juneau, just enough time for one glass of complimentary Coke. Alaska Airlines is headquartered in Seattle; about 10,000 employees, and about 100 cities served in the US, Canada and Mexico. Sam and I are on a 737-400, a moderate sized-plane with well-worn leather seats. I read that the airline turned a profit last year, no bankruptcy in view. 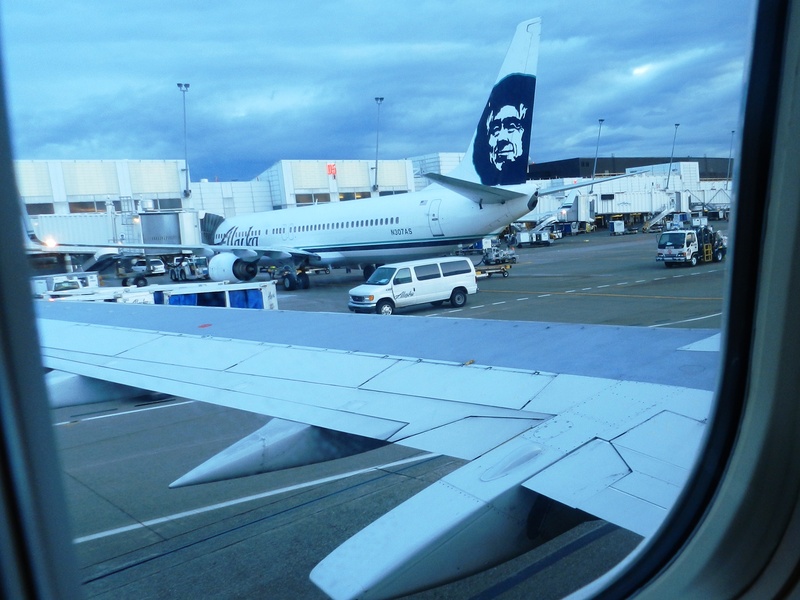 A lot of cargo is shipped via Alaska Airlines; traffic is high between Anchorage and Seattle; there’s that fresh Alaskan seafood coming south; mail and goods for remote Alaskan communities going north. 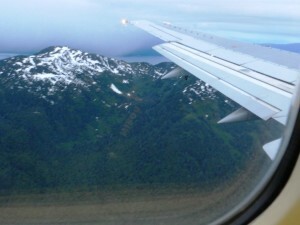 Prudhoe Bay, Barrow, Kotzebue, Nome, and Sitka to name a few; and Juneau, the governmental gathering place, depend on regular flights to stay connected. A moment’s indecision. Announcement, last chance to use the restroom! Is it worth the unbuckling and the climb over the passenger by the aisle? We decide not. No longer seeing mountaintops; we’re even with them now; waterfalls are right beside our window view, a fishing boat at water’s edge; we’re down and energy revives. Is this cool or what? We’re in Alaska now! 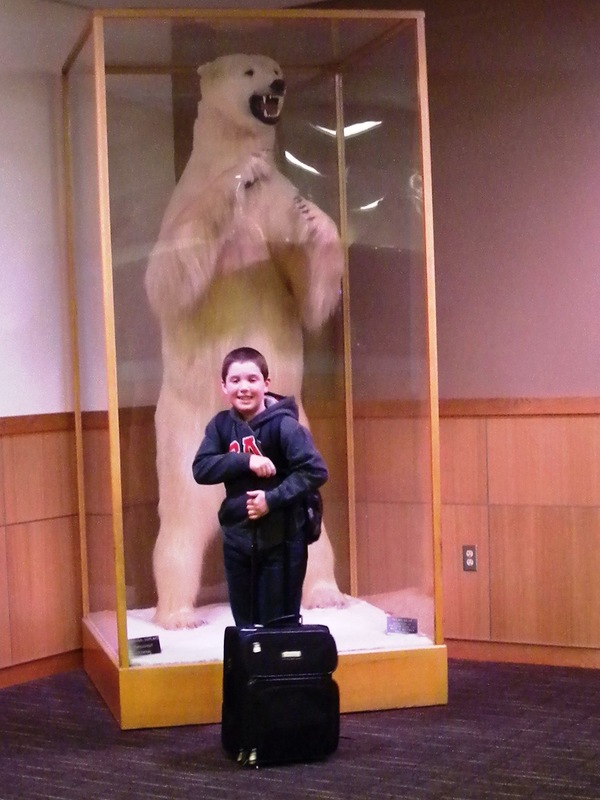 An easy walk in the Juneau airport; past the grizzly in a box; past the polar bear; my bag is coming round the luggage belt, grab and go! Our van is waiting just outside the door; our room is ready at the Lodge. Sam and I are tickled with ourselves; giant square metal keys in hand, we dump our suitcases on the floor and settle in, ready to be Alaskanized. Sun sets at 9:49 PM; rises tomorrow at 4:19. We’ll have 17 hours and 28 minutes of daylight; just wait and see what we’ll do with it.